The school populations of Nevada and Arizona are expected to increase by 20 percent in the next decade—but these states also are in the bottom 10 on the list of per-pupil spending. New projections on student enrollment from the federal government hint at the financial pressure many states will face as their student populations rise considerably in the next decade. The data, released last week by the National Center on Education Statistics, forecast that the nation’s number of public school students from prekindergarten through high school will grow by 7 percent between 2011 and 2022. Leading the charge are states in the Western and Southern parts of the United States. The school populations of Nevada and Arizona are expected to swell by more than 20 percent. Utah is set to grow by 19 percent, and Texas by more than 15 percent. Florida, the researchers write, can look forward to 14 percent growth. But these states stand out for another reason as well. The states expected to grow the most also are among those that spend the least per student. Arizona, Florida, Nevada, Texas and Utah all fall in the bottom 10 on the list of state expenditures per pupil, according to Education Week data released this year. State and local money tend to comprise nine out of 10 dollars spent on students, though those students with disabilities or from cash-strapped homes receive a larger share of funding from the federal government. By comparison, while states in the Northeast tend to spend more per pupil, student populations in that region are set to stay flat. New Jersey is projected to shrink by 2 percent. New York will grow by an anemic 0.6 percent. The nine-state region overall is only slated to grow by 0.2 percent. Younger students account for the bulk of the expanding figures, as those in K-8 are expected to increase by 8 percent, while high school students will grow by just 1 percent. Almost all of the net student growth is due to the boom in Hispanic students. 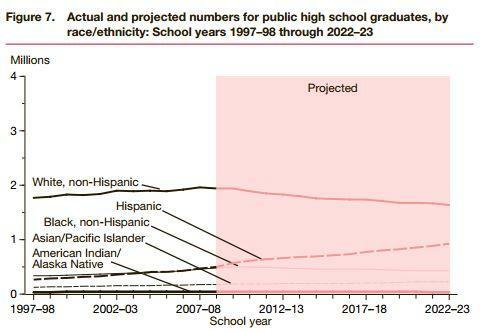 The NCES researchers estimate Hispanic enrollment will surge by a third while the white student population will decrease by 5 percent. Asian/Pacific Islanders are slated to grow by a fifth, though current enrollment figures for this demographic group are low. Black student enrollment is expected to increase by 5 percent. The data do not factor possible changes in state or federal law to increase early education enrollment. The Southwest and Southern states expected to grow the most will have to ramp up spending on students just to keep per-pupil spending flat. Whether the projections will spur policy makers to tweak their funding formulas is an open question. “State policy makers, because there’s so much going on between the here and now, I can’t think of any school funding formula that reflects changes ten years down the line,” says Mike Griffith, a senior school finance analyst for the Education Commission of the States. For states like Pennsylvania and Vermont, which for years have lost students, the coming decade will bring an influx of young learners and likely fresh considerations about budgeting for the rise in the number of pupils. The demographic sea change will likely force many states to spend more than they have before. Griffith notes that achievement level gaps are wider between students who are and aren’t English language learners than between low-income and wealthier students. But the U.S. Hispanic population is changing, too, and more students from households where Spanish is spoken at home are comfortable with English as well. Elsewhere in the study, the researchers indicate private schools will continue to see enrollments dip: After losing over a tenth of their students between 1997 and 2011, these schools will slouch by another 5 percent in the next decade. 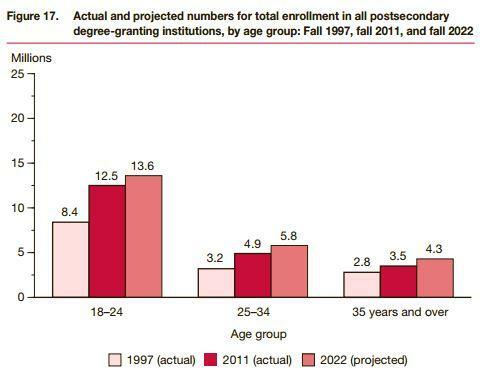 And while college completion is expected to tick upward, it’ll occur at a far lower rate than this past decade and still rely on students ages 18 -25 to make up the bulk of the enrollment. White students will continue to represent the majority of all postsecondary students.